Page = Scene = FIGHT! Individual pages usually work best when following the Greek dramatic unities: one place, one time, one action. Before Chris Bachalo signed on for what seemed an interminable run on X-Men to the disappointment of all, (X-Men fans were consistently baffled and frustrated by his chunky characters and bizarre framing choices; Bachalo fans were consistently baffled and frustrated by the inane and inconsequential storylines one of our generation’s greatest stylists was wasting his talents on (see also: Jae Lee)) he was the exemplar of this type of storytelling. Check out his Death: The Time of Your Life for a cogent plotter’s masterpiece. Every page is a beautifully designed, perfectly timed capsule of a scene with a final panel that serves as a clever visual mirror of the first panel of the following page. These visual rhymes carry the reader continuously through the story, uniting these disparate single-page scenes like Dante’s interlocking terza rima. It illustrates deftly the proper use of a page as a chunking device. Scene transitions which occur mid-page, as in the hands of less considerate artists, always come off as jarring and awkward. It’s like a t.v. show trying to squeeze a scene change into those first couple minutes before the credits/commercial break: it defies expectations and misuses space/time. “The wise man knoweth when to speak, and when to shuteth up” indeed! Stan Lee looked at this page, and even a ruthless self-promoter like he realized he could not cover up this greatness with the usual superfluous drivel. Does this really need even one “Take that, Batroc the Leaper!”? Stan and I think not. This sequence it so outtasite it’s beyond words, but we all know I’ll try. Briefly, just note how the anatomical positions lead us from panel to panel and tier to tier. Every punch or kick is in the direction of the read, with Batroc often hammered into the gutter or smashed against the last frame of a tier. Cap’s backhand at the end of the first tier even helps spin our eyes back across the page to the beginning of the next tier. His bent leg performs a similar function at the end of the second. We can pretty much trace a bouncy through line across the tiers just by focusing on the main double-lined motion blurs. Perhaps even more perfect is the control of time through empty space. There is no better way to start a fight scene than that opening panel with the windup of Batroc’s kick. It is all potential energy due to a brilliant combination of choices. It is framed from behind to give it an almost first-person feel: we are kicking this whole shebang off. That the rest of the action will be sideways until the final tier gives this a pause. That swooping vertical of a speedline pulls us from top to bottom to meet his leg, and contrasts with the horizontal nature of the rest as well. But perhaps the biggest reason for the slower pace of this image is all that wonderful negative space. Aside from the leg, nearly the entire top half of the panel is empty. This gives us that roller-coaster-climbing-the-hill-to-roller-coaster-falling intensity. Our eyes are relaxed at the top by the emptiness, but then swept into the whirlwind when the aforementioned swoop gives us all sorts of visual information to process at the bottom. And the pace never lets up from there. This sense of space only returns in the ultimate panel, a fantastic overhead shot of a tiger circling its kill, emphasized by the complete lack of a panel border (more on that in a post below). These spaces exist in contrast to the near constant barrage of starburst action slams as well. These bursts give the page a patterning, every panel a punctuation (that would be Kirby’s beloved exclamation mark), and the whole its appropriately explosive energy. A former student smartly observed that even when Batroc gets one hit in, his kick only warrants a measly baby-star compared to Cap’s constant supernova hits. We could tell just from the emanata who had this one in the bag! Now c’mon — that page is hot! 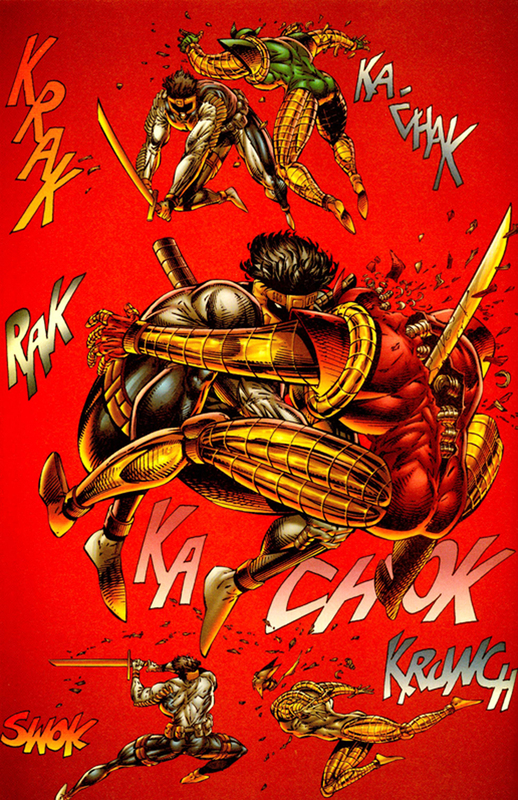 It’s easy to talk smack about Liefeld because in so many ways he is a terrible, incompetent artist, BUT in nearly none of the ways that matter to superhero books. You will find me defending him on this site waaaaay more often than deriding him. He is Pearl Jam and Bush and Stone Temple Pilots to me: largely unenjoyable as an adult for any reason beyond nostalgia, but fulfilling exactly what I wanted from a particular media at a time in my life when I was extremely devoted to that media. Liefeld was one of the first artists since Kirby to completely re-imagine what costumed characters could look like. Did he do so by completely ripping off a handful of Japanese comic artists? Yeah, but shouldn’t he have? Why the heck wasn’t everyone recreating what they did after looking at their first Masamune Shirow book? Did it just require a Californian with access to manga? Liefeld also not so much distilled anatomy to a core collection of pleasing shapes as neglected any bit he didn’t understand, but the bits he kept were the ones we want for superfolks. We want absurdly thick biceps and pecs. We’ll accept skinny ankles as part of the exchange. Who cares? Was he really just pushing Arthur Adams to an extreme he wouldn’t dare himself, with more cross-hatching? Yes, but again, at what point does this become a bad thing?!? Does anyone draw superheroes better than Arthur Adams? The man is butter slick. Did he completely lift nearly entire book’s worth of layouts from old George Perez stuff? Yep again. But COME ON. Unless you are some sort of creepy, stunted superhero apologist, you have to admit Perez’s art is really profoundly flawed, absurdly ugly, and completely lacking even a rudimentary sense of style. His layouts are killer (Infinity Gauntlet, man), but do not even pretend they were serving some sort of better purpose illustrating the stories of the TEEN TITANS than they were on X-Force. I am fully aware of just what a pile of dung X-Force was. I have a degree in English. I am here to tell you there is no quantifiable difference between that and those of any Perez DC work. Sorry guys. Read a novel. And this page is not a direct rip of anybody. It is clearly inspired by the type of Kirby page shown above, but it mixes that with a sort of Eisnerian page as meta-panel thing. The result is even more true to the “dance of violence” Kirby so often used to explain his aims. 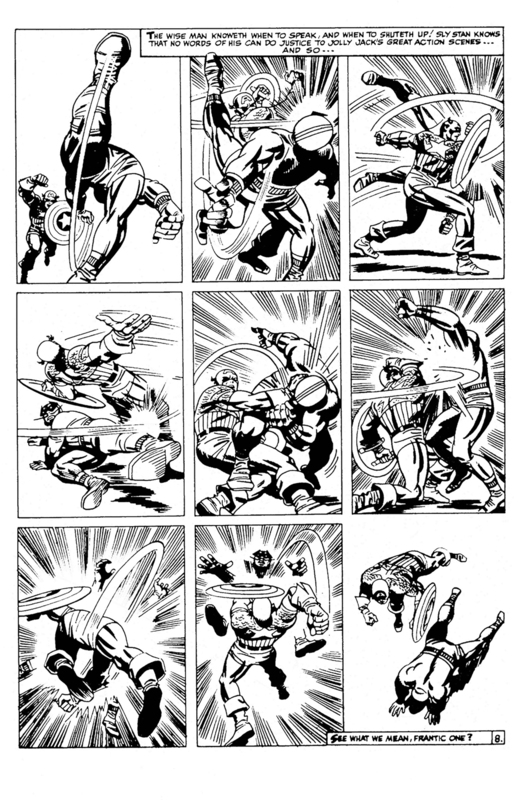 Kirby kept all his action above in a strict nine-panel grid. He nearly always used some variation of the grid, vacillating between nine, four and his beloved six. That “simplicity” of approach always gives his page the directness of punk rock. But here Liefeld not only steps away from a grid, he abandons panels altogether. The result is not comics as punk rock, it’s action as a ballet. A ballet of DEATH! With robots! This is flippin’ prog rock, and there’s nothing better than that. Nothing. The openness of the page allows the character, whoever he is — let’s call him Shattershaft — to dance across the whole stage, showing us the steps. And even those are simple but perfect: tight three-quarters left, tight three-quarters right, profile with extension to finish. The zooms in and out give variety and rhythm as well. And like any dance, we need a beat so Liefeld gives us sounds. I’m still falling for it. I read in one of Frederik Schodt’s excellent books on manga that a study concluded that readers spend an average of 3.75 seconds on a comic page. My own observations of myself and others has led me to believe that time frame to be fairly consistent, by which I mean not dependent on the contents of a page. Unless a writer really creates an absolutely confounding monologue or an artist completely botches an integral sequence, readers do not seem to change their flipping speed for “difficult,” wordy, nor beautiful pages. This yields somewhat counter-intuitive results, in my estimation. Single panel pages, which should ostensibly be flown through, allow one image to be lingered on or “drunk in” because that one drawing is granted the full 3.75 seconds. Pages with many panels, taken to the extreme above, should require a slower, more contemplative pace. But they do not. They seem to clock at the same 3.75, meaning the eyes need to whip through these images to make it in time. The reason for this, I purport, is twofold. The simple explanation is an artistic one. More panels also means more tiny lines on the page. This gives it a business, a frantic quality. One feels agitated and wants to rush through the brambles. Contrast this with the slow pace that the here absent negative space brought above. But the more interesting explanation is that the comic reader has an internal reading clock that is timed with the page. A comic book biorhythm, if you will. Our hand wants to flip to the next two page spread every 7.5 seconds, come Hell(blazer) or Highwater. Unconsciously, we assess the page and speed up or slow down our reading of individual panels to make sure we hit that finish line in time. This page tests that theory by taking the grid somewhere Jack never dared to go: 24 panels. Some of these are combined into rectangles or blown out into larger squares, but I’m still averaging about 13 panels a page. I believe this amps up the whole proceeding. My eyes careen through this page at a breakneck speed until the end. Perhaps I’m biased. To add to the cacophony, I threw in some full color panels that take place in a completely different time and place. I realize those are probably incomprehensible here, but in the context of the full work, (if it ever finds a publisher) I assure you their meaning will be clear. Pingback: Topics about Comics » Archive » Page = Scene = FIGHT! does that mean that “more is less”? the more panels per page the quicker we view each panel? thats neat! its like each page has a “frame rate” like in animation and you can “time” the expected frame rate to the common visual expectation of 3.75. theres nothing to back this up but I feel that modern (and early) manga really understands this at its core. Sorry Josiah, but your pages there are a mess. I get that these are four tier breakdowns. Kirby did three tier consistently, as do most comics to this day, so his panel count could rarely have gone very high (if he ever wanted it to). 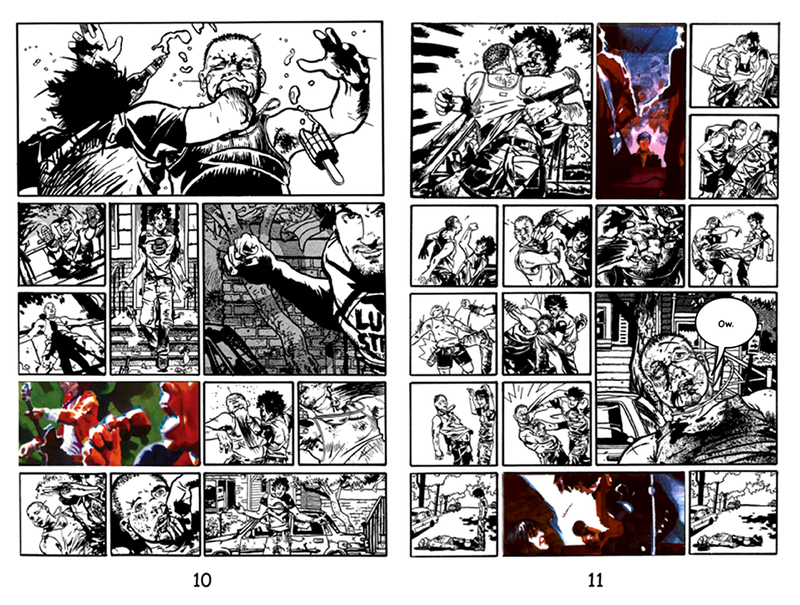 Frank Miller’s run on Daredevil is a good example of pushing panel counts up, and Miller also jumped back and forth between three- and four-tier layouts to get all those little panels in. So I’m not knocking the panel count or that it’s a four tier design. No, I’m knocking that you did vertical tier splits on the left and used converging vertical splits across multiple tiers on both those pages. The result is a geometric collage that ignorant and/or forgiving readers may muddle through, but that you as a teacher on the subject should have the sense to bury in a drawer and deny the existence of. Or at least use as an example of mistakes to avoid. The switch from color to line art between panels is fine. Killer breakdown problems ignored, that adds a nice visual rhythm.